Polymer Gel Market size was more than USD 38 billion in 2016 and will witness over 6% CAGR by 2024. Polymer gels serve a vast range of applications in various industries. Diverse types of polymer (crosslink) gels are expected to observe escalating demand for their unique and discrete properties suiting the requirements of different end-users such as personal care, medicals, oil & gas, etc. by 2024. Increasing ageing population especially in Japan & China along with booming population across the globe and increasing awareness towards healthcare will drive the demand for polymer gels over the forecast timespan. As stated by the World Health Organization (WHO), the share of the world’s population above 60 years will be almost double from 12% to 22% between the span 2015 to 2050 In order to suit the necessities of sustainable and safe livelihood of the population, healthcare reforms have been near the top of many national agendas. Such trends present brighter demand aspects for crosslink gels in the near future. Demand for the superabsorbent polymer (SAP) hydrogels has been driven by the personal care products including baby diapers, adult incontinence aids, and feminine care products. These areas will observe substantial demand for the crosslink gels in the next 7 years, particularly in the emerging nations. Adult incontinence products will observe faster growth with rising standards of healthcare, longer lifespans, aging population and most importantly-increasing awareness & acceptance of crosslink gel based products. Polymer gel market will exhibit exponential growth in the medical & healthcare applications by 2024. Hydrogel demand for medical applications will be substantially higher compared to their counterparts, by 2024. Hydrogels have been gaining wider acceptance in crosslink gel market for treating the dry chronic wounds. They form a moist wound environment and thus promote wound healing. Hydrogel based wound dressings result in absorbing wound debris and exudate, softening of dry necrotic tissue and removal of devitalized tissue. These crosslinked gels play a vital role as emergency burns treatment for their cooling and hydrating effect. Most common raw material used for superabsorbent polymer hydrogels has been poly acrylic acid, which held over 50% market share in 2016. The industry identifies a rising demand for usage of bio-ingredients in hydrogel manufacturing which present strong growth for hybrid hydrogels involving polysaccharide, cellulose, proteins, bio-based acrylic acid along with the prevailing synthetic materials. Industry participants are engaged in developing sustainable solutions to suit the varying consumer preferences. For instance, BASF has invested in bio-based acrylic acid from conversion of renewable materials to produce bio-based SAP hydrogels. The company will continue to innovate in this field in coming years as well. Silica has been the leading raw material for aerogels and is expected to lead the industry during the forecast timespan. Silica has proven to be an eco-friendly raw material with high thermal resistance. For instance, NASA used silica aerogels in its Mars exploration projects: ‘Opportunity’ and ’Spirit’ to suit the extreme temperature on Mars. However, polymers are gaining popularity in aerogel manufacturing and are expected to be the fastest growing raw material polymer gel market segment with a CAGR over 10%. Hydrogels led the overall polymer gel market in 2016 and are certain to have significant growth of more than 8.5% CAGR over the forecast timespan. 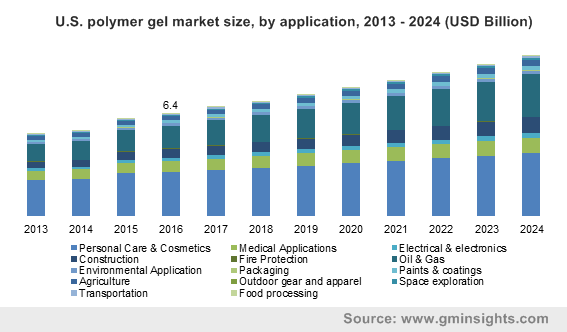 Rising share of demand for hydrogels for their robust absorption capacities, in medical applications, personal care, electrical & electronics, agriculture and other applications will drive their share in crosslink gel market over the forecast timespan. Soft contact lenses and agricultural applications will be the newer areas of exploration for hydrogels. The eye-care industry has been striving to achieve the solutions with enhanced corneal oxygenation. Silicone hydrogels are gaining robust demand for their increased oxygen permeability, comfortable & longer wear and wettability. Superabsorbent polymer hydrogels are likely to have robust growth in the agricultural sector by 2024. They are used in several agricultural applications: seed coating, root dipping, soil broadcasting, flower beds, ornamental gardens, etc. They increase the plant’s water holding capacity, aeration balance & structure of soils, substrates, etc. Aerogels will be the fastest growing crosslink gels segment by 2024. Aerogels hold some unique features including extreme porosity, ultralow density, resistance to thermal transfer, superlative energy damping which make them provide highly effective insulation. They are made of hydrophobic silica hold supreme absorption characteristics and absorb water & other water repelling water-oil for instance. The product being thinner, have been widely accepted as an alternative to the traditional insulation materials including: glass wool, stone wool, cellulose, polystyrene and polyurethane foam. For instance, in Braskem’s biobased ethylene production plant in Brazil, the composite 60 mm of Aspen Aerogel insulation was used instead of the traditionally specified 150 mm of polyurethane insulation. However, the high cost involved in aerogel production and stiff competition from the established insulating materials will be challenging for the industry players by 2024. Particle form including granules, micro-particles and powders led the crosslink gel market in 2016, with a substantial share over 40%. The massive share is attributed to their vast usage in various applications: personal care, agriculture, etc. Amorphous gel form is likely to observe growth with CAGR over 7% during the forecast timespan. Rising hydrogel use in various wound care solutions is expected to drive the demand for amorphous gel form. In global crosslink gel market, blanket form of aerogels was prevalent in contrast to the other forms in 2016 and is expected to rise over CAGR 7% by 2024. Compression packs has been a recent trend in aerogel blankets especially in pipeline insulation. Solid molded forms will also witness rise with rising polymer gel usage in contact lenses. Medical applications for polymer gel market will observe exponential gains over the forecast timeframe. All types of polymer gels find a range of applications in medical & healthcare sector, for instance, drug delivery system, contact lenses, wound care, cosmetic surgeries (breast implants), tissue engineering, bone regeneration, cartilage repair, cardiac regeneration, spinal cord repair, etc. In 2016, oil & gas industry held massive share close to 60% in the overall demand for aerogels. Oil & gas applications will witness rising demand trends for the overall polymer gel market by 2024. Superabsorbent polymer hydrogels prevent drilling fluids from escaping to different layers in oil & gas industry and exhibit significant fluid loss control along with spill prevention. They are also used in fracturing fluids, by increasing their efficiency through viscosity modification. Aerogels are used in the oil & gas industry for subsea insulation systems, for deep-water pipe-in-pipe tieback installations, for LNG terminals, in the areas of: bellows, pumps, mechanical clashes, vertical piping & equipment, passive fire protection, acoustic insulation, live installs, etc. Aerogels have been gaining significant demand for insulation applications. Efficient performance, control of heat losses and emission compliance are mandatory for the sustainable operations at any manufacturing site. Aerogel insulations contribute to these requirements by providing efficient thermal insulation at the facilities. Electrical & electronics industry has also been identifying rising popularity for the polymer gels in the recent years. For instance, hydrogels are used in robotics applications including manufacturing artificial muscles and robotic actuators. Superabsorbent polymer hydrogels are used as water blocking solutions for the wire & cable industry. In telecommunication applications, these hydrogels are used in coaxial and optical cables. They are also used in underground cables, underwater cables, etc. For instance, CABLOC by Evonik Industries AG. Various characteristics of aerogels for instance, extremely low density, ultralow thermal conductivity, low dielectric constant, high specific surface area and good optical transparency make them highly desirable in electrical & electronics applications as: high-performance insulators, substrates for electrodes in ultracapacitor/supercapacitor architectures, batteries and desalination applications. Global polymer gel market was led by Asia Pacific in 2016 with a share close to 30%. The regional personal care industry has been rising with tremendous pace which in turn present brighter potential for crosslink gels. Rising infrastructural initiatives, increasing healthcare spending, enhancing standards of living, prominent level of discretionary expenditure, rising preference for premium product usage, organized retail, increased westernization of FMCG markets and the vociferously booming e-commerce are some significant trends portraying bright growth aspects for polymer gel market in Asia Pacific by 2024. Significant hydrogel manufacturers include: 3M, Smith & Nephew, BASF, Coloplast, Cardinal Health, KAO Corporation, Hydrogel Healthcare Ltd., SILIPOS Holding LLC, B. Braun Melsungen AG, Medtronic Inc., LG Chem Ltd., Sanyo, Alliqua Biomedical Inc., Formosa Plastics Corporation, Medline Industries Inc., Cooper Company, Ashland, Hollister,etc. Major players in superabsorbent polymer hydrogel constitute over 50% of total polymer gel market share. Major participants in aerogels area include: Aspen Aerogels, Aerogel Technologies, Aerogel UK Ltd, Active Aerogels, Cabot Corporation, Svenska Aerogel, JIOS Aerogel, Bluesift, Active Space Technologies, Empa, ENERSENS. Aerogels market observes significant consolidation with high R&D initiatives from these players. A polymer gel consists of three-dimensional crosslink polymer network and has the interstitial spaces filled with a medium (fluid). They can undergo significant deformation and try to balance the internal pressure and external pressure by exchanging matter and energy. Polymer gel market is led by hydrogels, which are three-dimensional hydrophilic, polymeric networks which are capable of absorbing enormous amounts of water while still remaining insoluble in aqueous solutions. The polymeric networks with three-dimensional crosslinking set the basic difference between the hydrogels and common gels-with a linear structure. Aerogels are created by combining a polymer with a solvent to form a gel, and then removing the moisture from the gel and replacing it with air while still maintaining the gel structure. Crosslink gel market is expected to observe substantial rise in the aerogels by 2024.